Fast, effective and with a working width of 350mm, the Blastrac 350VH is perfect for all vertical steel blast cleaning applications. It is remote controlled for operator safety, comfort, and productivity. It is remote controlled for operator safety, comfort, and productivity. The Blastrac 350VH is a vertical steel blast cleaning machine, designed to clean vertical surfaces, such as oil / storage / water tank shells, ship hulls and many more. Blastrac has designed a full range of Internal and External rigging / winch systems, dust collectors, consumables and optional items which give the opportunity to process any specific application. All our steel blasters have a user friendly control panel which makes it easy to operate the machine. Every steel blaster comes with extra safety features. Depending on the type of project and application, you can choose a steel blaster with an electrical or hydraulic drive system. Ask us for advice! Every Blastrac steel blaster should be connected to a Blastrac industrial dust collector. This means that you are able to work dust free, creating a safe working environment. Depending on the material you want to remove and the result you want to achieve, you can choose different types of abrasives, all are available at Blastrac. Blastrac steel blasters are most of the time transported from job site to job site. 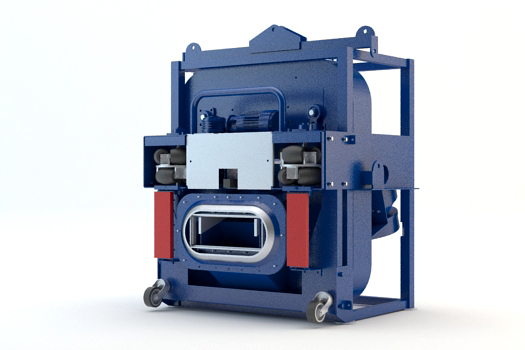 Our steel blasters are heavy duty and strongly fabricated to create minimum downtime. Our steel blasters, like any other Blastrac machine, do not use any chemicals or waste valuable drinking water. The Blastrac 350E steel shot blaster is perfect for small and medium-sized jobs. Its modular construction allows for it to be easily disassembled and reassembled through a space of 600 mm. The Blastrac 350S steel blast cleaning machine is the hydraulic version of the Blastrac 350E. It is specially designed to be able to process the stepped steel sheets relief on floor make up. Special electrical safety device, to be able to use the machine for storage tank blasting. Explosion proof electrical panels (IP66/67) / (EXD II 2G d II B T4) & explosion proof electrical motors. The Blastrac 500E Global steel blast cleaning machine has a great production width and an easily assembled modular construction to allow it to pass through narrow openings and hard to reach places for steel cleaning. The largest heavy-duty steel blast cleaning machine of our range equipped with a hydraulic drive system. The high work rate, proven durability, and operator comfort make the 600S-EBE ideal for large jobs. Similar to the Blastrac 350VH, the Blastrac 900VMB has an increased production width and greater productivity. It is remote controlled for operator safety, comfort, and productivity.